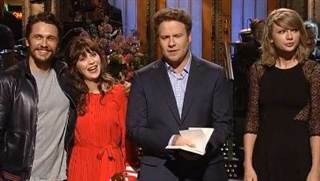 This Just In: Taylor Swift makes a cameo on Saturday Night Live! It’s too cold outside for angels to fly, Taylor Nation. The Blonde Who Left Her Sparkly Guitar At Home appeared briefly during Seth Rogen’s Saturday Night Live monologue last night, April 12. The guest host had already told pals Zooey Deschanel and James Franco he didn’t need any help when Taylor walked onto the stage unannounced. T-Swizzle, who can make fun of herself like no other, had the best line: “You’re getting really upset, and whenever a man shows emotion, I appear.” The setup and start of the line were lost. The cheering when she came on made it hard to hear what they were saying. However, Taylor’s delivery was flawless. The Sparkly Dressed got to announce that Ed Sheeran was on the show. The talented Ed perform his current single “Sing” and a new track from his new album, “Don’t”. Here at the Swift Agency, just a guy who appears when food is served, we all remember the Forever and Always Fearless One doing her thing on Saturday Night Live back in November 2009. Actually it was my second post ever. That’s how long ago that was. I always feel like nowadays us fans get our Taylor Swift fix with an eyedropper. A minute of Tay Sway and then she’s gone again. But for now, enjoy. She appears close to the end. She also appeared during the good bye credits. Ed’s new album, X, will drop on June 2014. His current single, “Sing”, is out now. Next Next post: On a white veil occasion: New Taylor vlog at Gena Gabrielle’s bridal shower!